LAKE FOREST, Ill. - Lake Forest College women’s hockey player Ryann McCarthy (Lombard, Ill./Team Illinois) was named Northern Collegiate Hockey Association Player of the Week on Monday (February 19) for her performance in the Foresters’ 3-1 victory at UW-Stevens Point, the nation’s seventh-ranked team, on Saturday (February 17). McCarthy, a freshman goaltender, stopped 34 of 35 Pointer shots on goal in the contest. It was Lake Forest’s first-ever victory over Stevens Point, a program that is consistently ranked among the top 10 in the nation. The game occurred just eight days after McCarthy stopped 31 shots on goal in a 3-0 blanking of UW-River Falls in the Foresters’ first-ever win over the Falcons. McCarthy currently ranks tied-for-seventh in the country in winning percentage with a 7-1-2 record on the season. She is also 10th with a .924 save percentage. 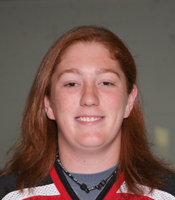 NCHA Players of the Week are selected by the league’s sports information director.